The KABT Fall Conference is returning to Emporia State University 10 September 2016 after many years alternating between the KU Field Station and Konza Prairie. We hope that you can join us for a day of collaboration where we can guarantee you something you can take back and use in your classroom the next week. Many of the presentations at our 2016 Conference will focus on the use biological specimens, live organisms, and hazardous materials with students and in an educational setting. Our presenters are classroom teachers, professionals from regulatory agencies, and college professors. 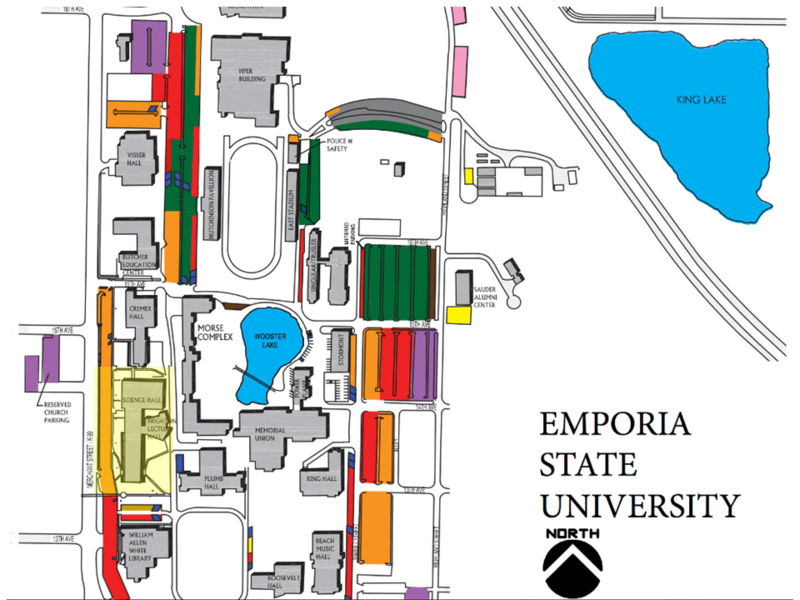 The conference will take place on the ESU Campus in the Science Building (highlighted yellow on the map). Free parking will be available in the lot located behind the Science Building (orange on the map). The conference cost is $15 and KABT memberships (starting at $15) can be purchased or renewed at the door. Conference presentations proposals can be submitted here (closing soon). The current agenda is available here: KABT_2016ConferenceAgenda. If you have any questions, please contact Drew Ising at drewising@gmail (email) or @ItsIsing (Twitter). 8:15-9:00AM Registration. Light refreshments available. 12:00-1:00PM LUNCH. KABT Members will meet from 11:55-12:05 to vote on KABT Officers and Representatives. The event is Saturday, September 10th.